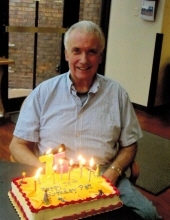 Patrick J. Madden, age 77, passed away on February 8, 2019 at North Central Health Care, Gardenside Crossing unit. He had been a patient there since June 21, 2016. He was born on July 14, 1941 at Riverview Hospital in Wisconsin Rapids, WI, to the late Donald and Gloria (Siemers) Madden. He attended grade and high school there. After graduating high school, he joined the United States Air Force from 1959 – 1963, he was a Marksmanship Instructor. While in the Air Force in Minot, North Dakota, Pat met and married Lyla Huber on October 10, 1964 in Lemmon, South Dakota. Shortly after their marriage, they moved to Marshfield, WI, where they lived for a couple of years. They then moved to Wausau where Pat worked for the Marathon County Sheriff’s Dept. He began his employment with them on March 16, 1966 as a Deputy Sheriff. He retired on June 1, 1995. He spent his entire career in the Patrol Division and held the rank of Sergeant upon retirement. For many years he coordinated the boat and snowmobile patrol and taught safety classes. After retirement he also did security and delivery work. Patrick owned several vintage cars and attended many old car shows. He also owned and rode motorcycle traveling extensively over the years. Getting together with family and friends was always special to him. His wife Lyla preceded him in death on July 3, 2016; along with his parents. In lieu of flowers, memorials may be given to the Alzheimer’s Association, 300 3rd St., Wausau, WI 54403. A celebration of life will be held on Friday, Feb. 15, 2019, at Restlawn Memorial Park Cemetery, 235962 North Troy St. Wausau (in the Chapel). Visitation will be from 1 - 2:00 p.m. with a service at 2:00. To send flowers or a remembrance gift to the family of Patrick J. Madden, please visit our Tribute Store. "Email Address" would like to share the life celebration of Patrick J. Madden. Click on the "link" to go to share a favorite memory or leave a condolence message for the family.